I just realized I can't even dance as well as strung out, dystopic Russians. I'll be honest, I don't know a ton about the actual U.S.S.R. It seemed like it turned out okay for some folks and really, really badly for others. Overall, though, I can certainly think of worse places to spend a few years. 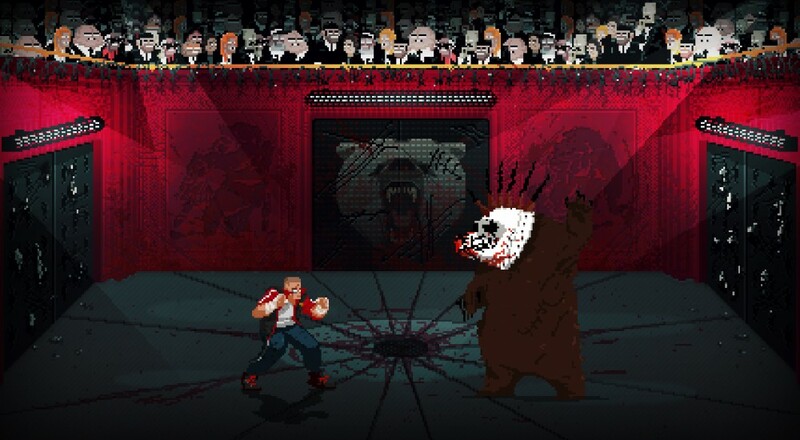 Mother Russia Bleeds' version of the U.S.S.R., though? That place needs to be surgically removed from the face of alt-Earth. I haven't seen a single clip of MRB so far that doesn't include some combination of facial reconstruction, used needles, and hulked-out lackeys. Luckily, none of us have to live there, we simply have to guide four drug-addled prisoners on some sort of vengeance quest through it and its hordes of angry, similarly drug-addled antagonists. The game is out on September 5th for PC, Mac, and Linux, so developer Le Cartel decided to commemorate the announcement with a 64 second video of its pure, unfiltered violence. MRB sports four player local and online co-op, which you and your crew can utilize to brawl through the game's Campaign and Survival modes. Sometime after launch, a Boss Rush mode will join the fray as well, something the press release assures us we "are not prepared for in any meaningful way". The PlayStation 4 was conspicuously absent from the above release list, but Sony's flagship console will be rife with communistic violence soon enough, as MRB is headed there in the Fall of this year. Page created in 1.1005 seconds.